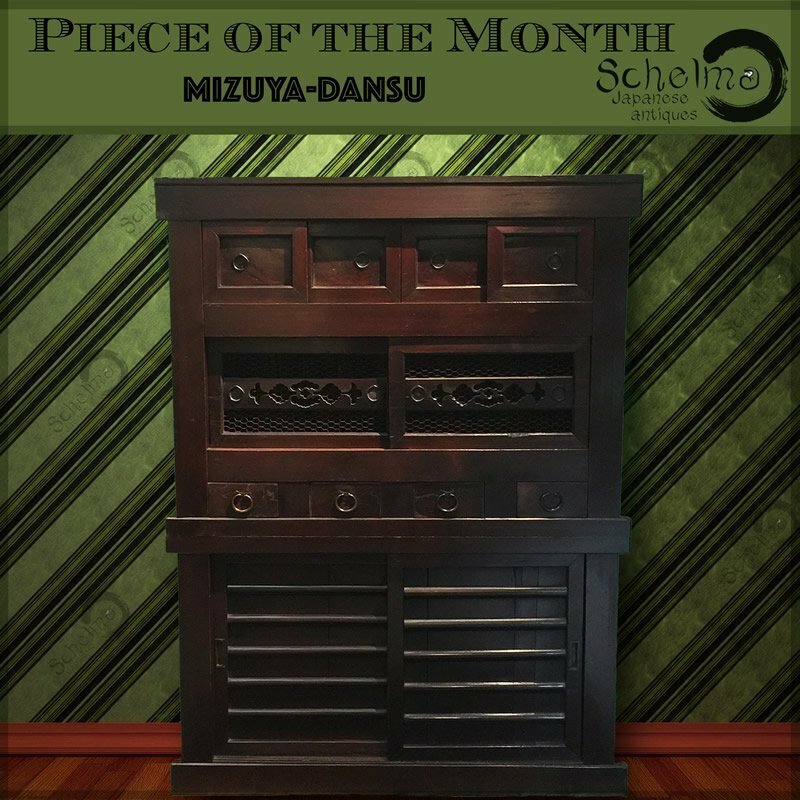 Mizuya-dansu is the most common term for two-section stacking kitchen chests. This name is derived from the word mizuya (literally: place of water). A space adjacent to the main room of a teahouse where shelving and a bamboo grate existed for cleaning and storing ceramics. The kitchen chests are also known as daidokoro todana (kitchen shelves). Kitchen tansu is a result of the transformation of eating and cooking habits in the Edo-period. Without this evolution, such cabinets would not have been needed or desired. The change was driven by new vegetables and other crops which allowed the Japanese to devote time to the art of making meals rather than cooking one-pot meals for survival. It is not mere coincidence that the first cookbooks arrived in the same period as the birth of kitchen cabinetry. Coinciding with crops and cooking was the transformation of the kitchen space itself. The development of fuel-efficient kamado (earthen ovens) transformed traditional work spaces in urban and wealthier rural homes into true kitchens; spaces wholly dedicated to the art of cooking. The mizuya adjacent and at hand, filled with foods, ceramic dishes, cookbooks, and utensils, complete the picture. 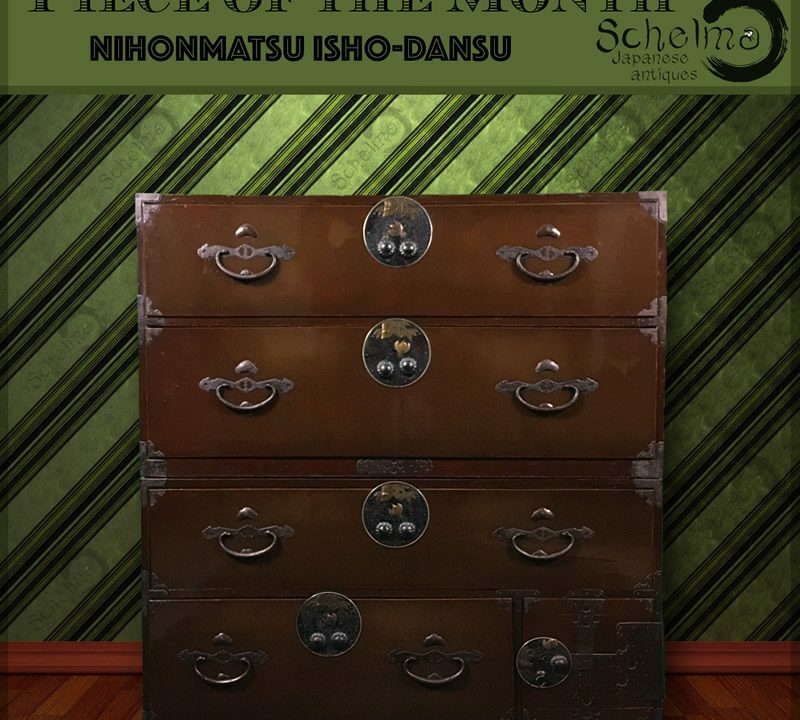 Hikone, the castle town on Lake Biwa in the Omi Province is said to be the birthplace of the kitchen-chest design. They became widespread, with variations made in the Kyoto, Omi, and Nagoya vicinities. The kitchen chests had common depths of 40 To 50 cm and widths of 170 to 180 cm, with similar heights. Some mizuya exceeded 240 cm in length, and still others less than 120 cm. These cupboard lengths, of course, reflected the standardized measurements of household spaces that were becoming common to Edo-period homes. Some mizuya chests, referred to as hachidai mizuya (literally, a place to store pots). had open door-less compartments, the space within containing staggered shelves used to display perhaps a coveted tea bowl. 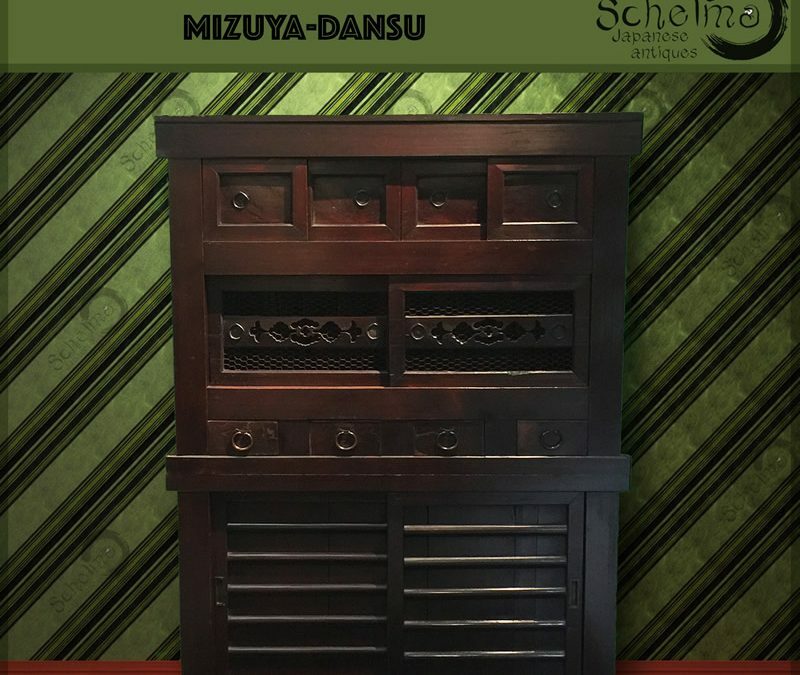 Like most tansu, mizuya were essentially chest-on-chest designs that allowed mobility. Common to most mizuya is the compartment enclosed by two sliding doors backed by screen or open mesh; the resulting enclosed space is much like a food safe. Many of the other compartments held ceramics, lacquer trays, pots, and utensils. The kitchen tansu, because of their design, are some of the chests most easily incorporated into today's Western homes. The woods used for the carcase were hinoki (cypress) and sugi (cedar) with keyaki (zelkova elm) for the drawer fronts and sometimes the door panels. Some kitchen chests used kaki (persimmon) instead of keyaki. 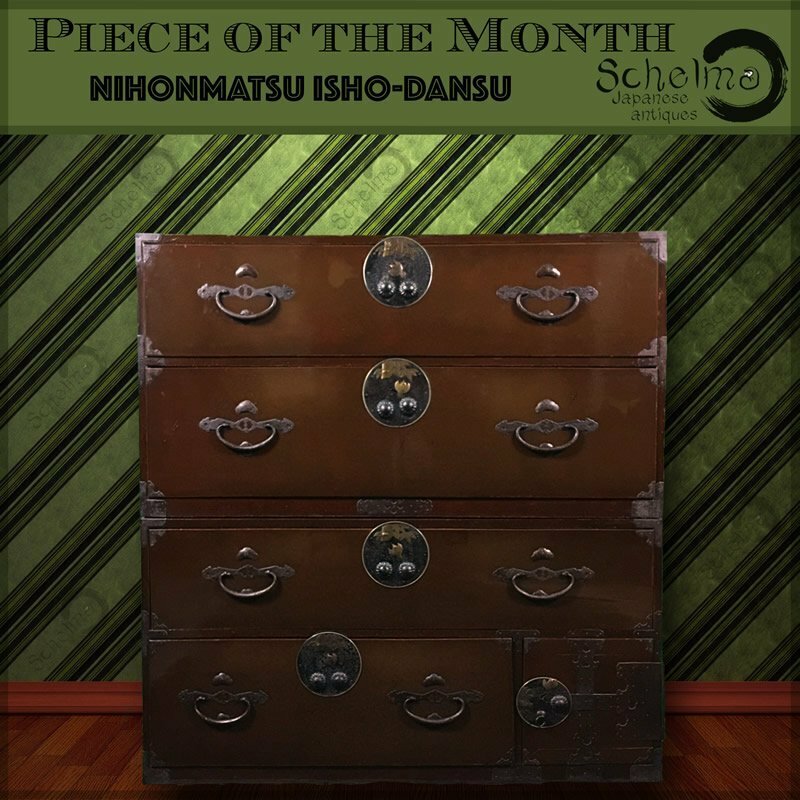 These chests are usually from the late Meiji and Taisho eras. Finishes on kitchen tansu ranged from stains to wiped lacquer. Of course. years of smoke in the cooking area no doubt had its own finishing effect. The carcase exhibited mortise-and-tenon joinery throughout, with affixed panels and interior shelves being common.